I actually wear my feelings about Dar on my sleeve: I really don’t like it here. As I am writing this, the power is out and only one of my three fans is spinning and keeping me cool. The heat, the traffic, the dirtiness, the bad food, the inconvenience – truthfully, it’s everything I expected out of a huge African city. I am so excited to get back to the States where I can make a quick drive to a good restaurant and sit in the aircon. It’s been really draining being in Dar for so long, and we are both ready to leave. But of course, these problems are not just in Dar, or Tanzania, or Africa – you can find the same issues in Mumbai or Manila or Mexico City. I’m sure we would have a much different opinion if we lived in a smaller city that was cooler and walkable. Plus Dar has been an awesome place to want to leave on the weekends to explore the rest of the country. So instead of only complaining listing every frustration in this post, I’ll talk about two of the things that really frustrate me the most: how much of a pain it is to get anywhere, and the loud music. Luckily I have one story about a day trip that really captures both of these well. Rewind to about 7 weeks ago. Sara, Meredith and I just returned from a reasonably successful day-trip boating to and snorkeling around Simba Island. 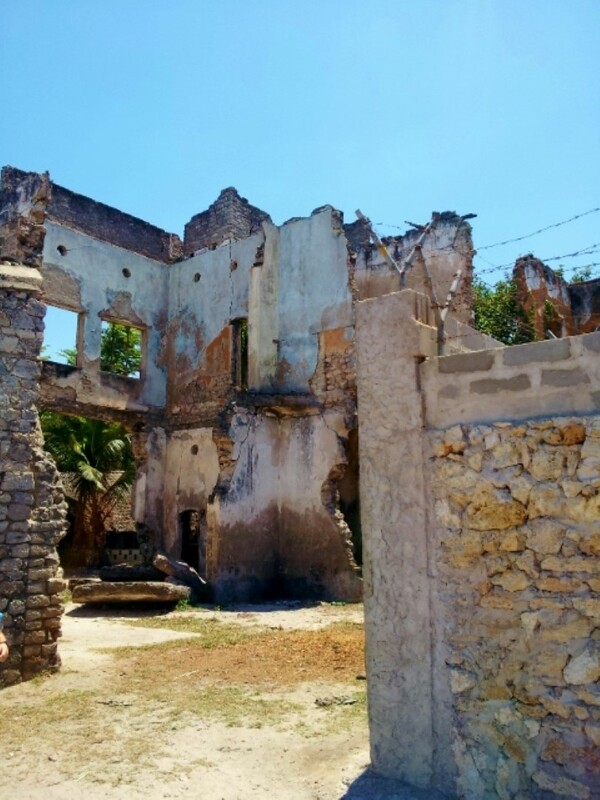 As expected, we came back a bit sunburned and hot and tired, but we were ambitious and still motivated enough to plan a trip for the next day to the nearby town of Bagamoyo, which was once the biggest port in Africa and a center for the slave trade during Arab times. Sounds cool, right? Tanzanians love their parties and music (like most people), but they like it loud. Like, to the point where if you’re in a mile radius and you can’t hear it, it’s too soft kind of loud. The Msimbazi Center where we’re staying is actually really quiet at night, except, as we found out, for Saturdays. A lot of locals use the Msimbazi Center church for weddings, and a few decide to use the adjacent party pavilion for their receptions. On this particular night, we were exhausted and ready to sleep by 10 so we could get up early the next day for Bagamoyo. At 8 PM, the music starts. Keep in mind, the party pavilion is over a half-mile and several buildings away, but the music was so loud that we had to put in headphones to hear a show we were watching on the computer. We figured they would never be so disrespectful to the nuns living here that they’d keep the music on until after 10, but we were wrong again. We tried to lay down to sleep, but it was so loud that even our custom-fit ear plugs didn’t block it out. The music stayed on until almost 1 AM. I was so incensed I was debating going over and smashing their stereo. It was not a proud moment for me. But I’m still traumatized by it – if I hear loud music after 6 PM, I instantly become on edge, ready to hulk smash the source. I’m pretty sure America used this same technique to torture prisoners. Anyway, we have remedied this frustration by not staying at Msimbazi any other Saturday nights. I’d rather pay for the Holiday Inn than deal with that again. So the next morning, sleep deprived and sunburnt, and against my better judgment, I decide to join Sara and Meredith on the trip to Bagamoyo. This trip was a clusterf*&k from start to finish. Our taxi to the bus station wanted us to pay extra for gas, and when we refused, had to give his tire changing tools as equity to the gas station we sputtered in to just to make it there. “Bus station” is a poor choice of words. It’s actually just a bunch of busses lined up on the street, and they leave when they are full. This is not uncommon, really – we did this in Armenia and many other countries. Full in Dar means something different. Not only was every seat full, but had to wait until all standing room was exhausted before we’d move. There is no aircon, of course, so it’s hot, but after 20 minutes of waiting we were finally on the road. We stopped at a couple of bus stops, let others on and off, but in general, things were looking up. Until we stopped at a bus station about 15 minutes up the road. Half the bus unloaded, and we realized we would have to wait, again, for the bus to fill up, standing room only. 2.5 hours and 2 more stops like this later, we finally completed the (not kidding) only 59 KM (36 mile) trip and arrived in Bagamoyo. At this point I was drenched in sweat, cranky, and hungry. All I wanted was to go to a restaurant with aircon and get some reasonably tasty food. Since this place is in Lonely Planet, has a big music festival every year, and is a “tourist destination”, I figured this would be easy. Wrong. No such place like this exists in all of Bagamoyo. Instead we took a bajaji to a road-side stand where we eat chips mayai, my daily staple, with our hands (no soap available, of course). Whatever. At this point, we figured let’s go see the ruins and at least accomplish something for the day. I’m sorry, but Bagamoyo is a dump. The beach is gross, the buildings are run-down, and there is minimal tourist infrastructure (one map and one “info center” that was really just offering a tour, to be exact). 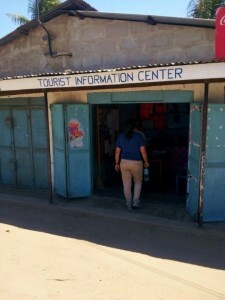 We finally arrived at the first site, a museum, and are asked to pay 20,000 TZS (about $12). This is astronomically high – our bus to Bagamoyo only cost 2,000 TZS (about $1). 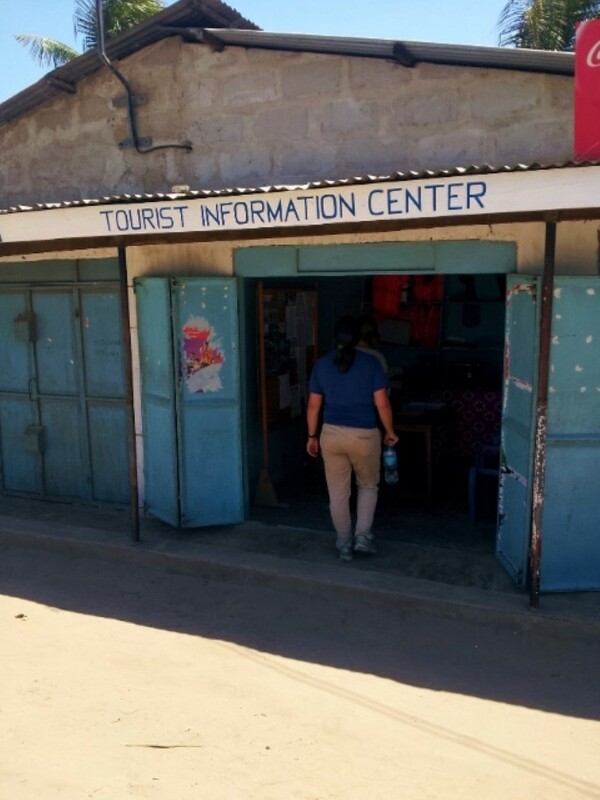 It turns out the price for locals is only 1,000 TZS, and instead of the government subsidizing the cost to make them more accessible to locals, they make the tourists subsidize the cost with high entrance fees. For this one-room museum, no way. We walked down to the old pier, the fish market, and some art stores – not too exciting, but at least free. We then set out for two of the “big” attractions: the old slave prison, and the ruins. Both are the same way – reasonably priced for locals, and gauged for tourists. When we’re traveling, we have days when we’ll just pay the price no matter how much of a rip-off it is, and we have days where we refuse in protest. This day was definitely the latter. We couldn’t justify spending over $35 each on some crappy ruins, so we just cut and run. We grabbed a bus, and 2.5 hours later we were back home in our (now quiet), toasty room. This was probably the hardest 24 hours we’ve had on our entire trip, and really gave me a lot of ill will towards Dar, Tanzania, and Africa. This place can be really frustrating, and unlike the other posts during Frustration Week, I get no catharsis from writing about this day. I’ve yet to find a silver lining and I can’t imagine laughing about it later. But I guess that’s the point – when we say traveling isn’t always awesome, we mean days like this. Fortunately, all this frustration with Dar at least gives us motivation to travel to places like Mafia Island and Ruaha NP and Gombe NP, which have really helped me enjoy Tanzania a lot more. Had only read your 1st ‘frustration post’, thanks for the easy links to the others so I could read them in order. Love all your posts and do try to read them all, but admit I think I have missed some of them. But do love and care about you both! Hope your travels home are going well. No worries Marilyn – we’d never question that :). We made it home, finally. Have a great Christmas.